After all the problems I have had this summer with sawfly on the roses and me giving the roses a good talking to, I think it has worked. For some anyway. I had really honestly had enough of trying to salvage some of the ailing plants, no sooner had they started to recover from one attack along came another. So some have been dug up and binned. 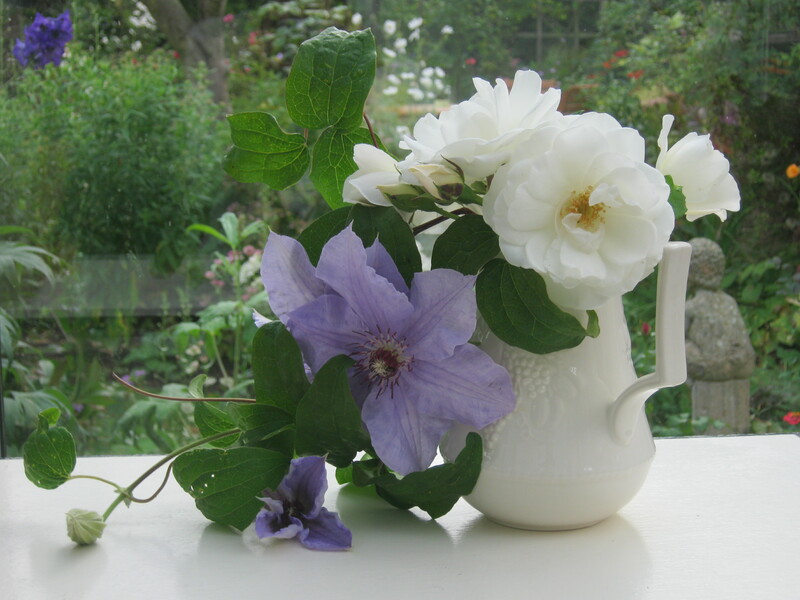 But to my astonishment about half a dozen near the conservatory have started to give out some beautiful blooms. Maybe the sawfly season is over and the weather is holding up and allowing the plants to do what they have been trying to do all summer..
Ballerina is now flowering for the first time this year, usually a very prolific bloomer, now although not many trusses it is very welcome all the same. This didn’t actually succumb to the dreaded sawfly but it was growing behind the granddaughters playhouse that we took down earlier in the summer. It had a prune and is now giving me some nice scented cutting material. 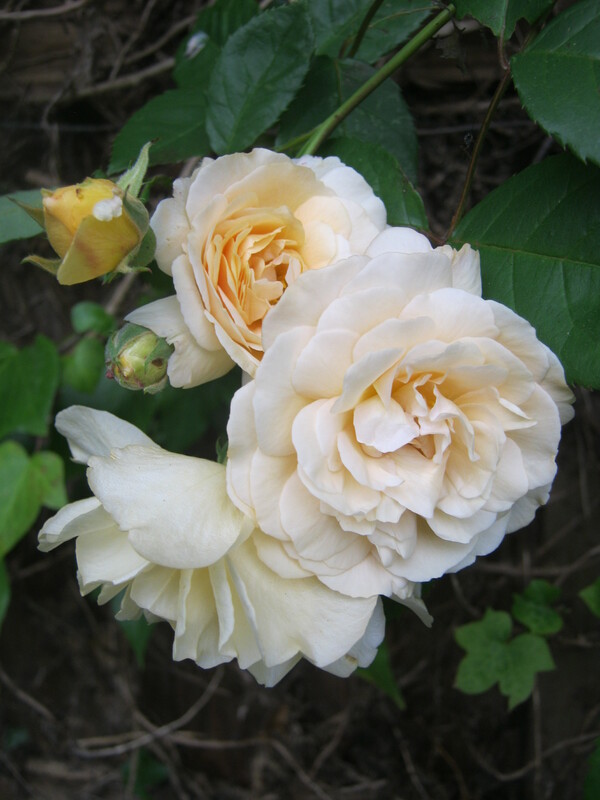 And one of my favourite roses for it’s perfectly shaped flowers and exquisite perfume. 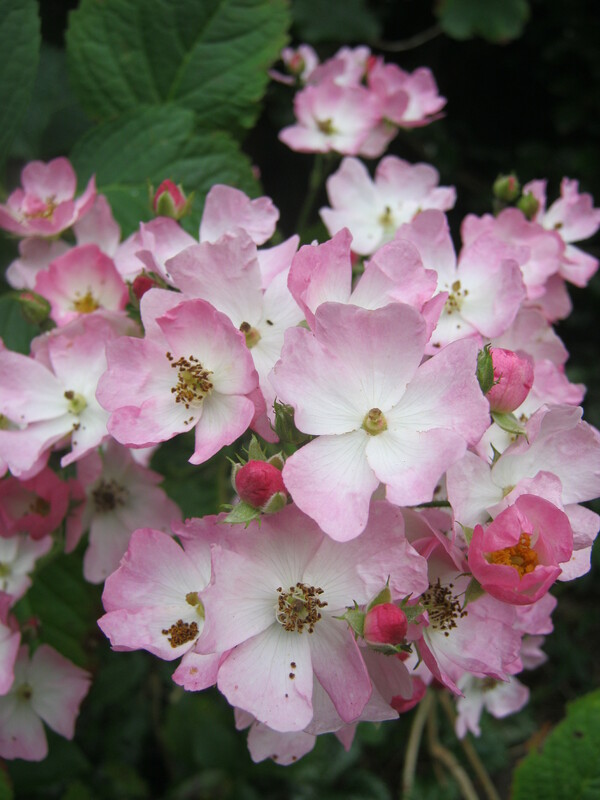 This has quite a lot of strong growth and about ten or more flowers and buds. It’s going to get such a shock it the weather changes. So a bit late in the day but for my Vase on Monday I have chosen Young Lycidas as my main flowers, along with Aster Alma Potschke and the stunning fading florets of Hydrangea Miranda looking more like a piece of faded old embroidery. …..I hope it brightens your day as much as it did mine…. Thank you Cathy from Rambling in the Garden for hosting this thread. Today I had a walk down to Mr Malc’s allotment. He’d had a load of manure delivered and had been busy digging the plot over in readiness for this, so I thought it would be good to see how it all looks. 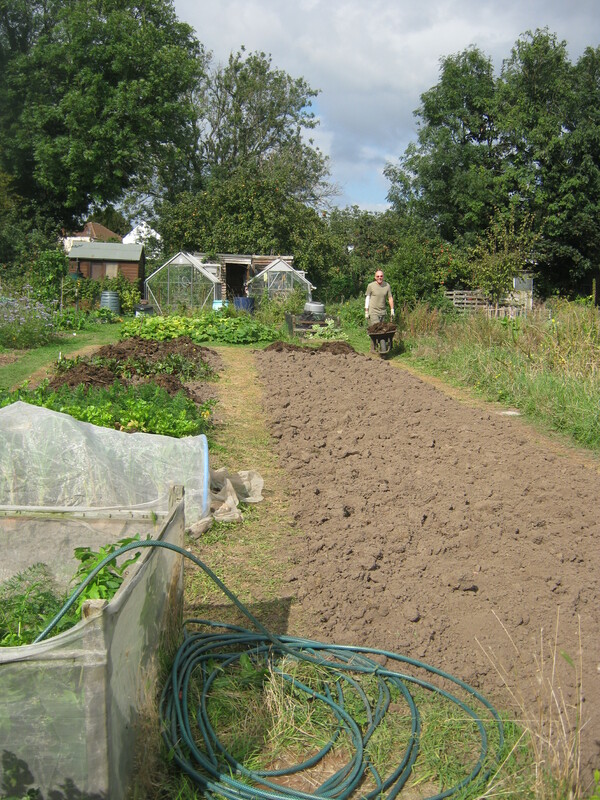 Since taking early retirement 10 years ago Mr M has taken on the care and management of our plot, and I have to say he does a fantastic job. We are practically self sufficient in most of our vegetables and quite a lot of fruit. This picture was taken a few weeks ago and this produce has nearly come to an end, now we are getting some lovely carrots and parsnips, the storeroom has all the onions strung up and several bags of potatoes. Two different sorts of kale are ready to use and we have been eating some lovely beetroot for the last few weeks. 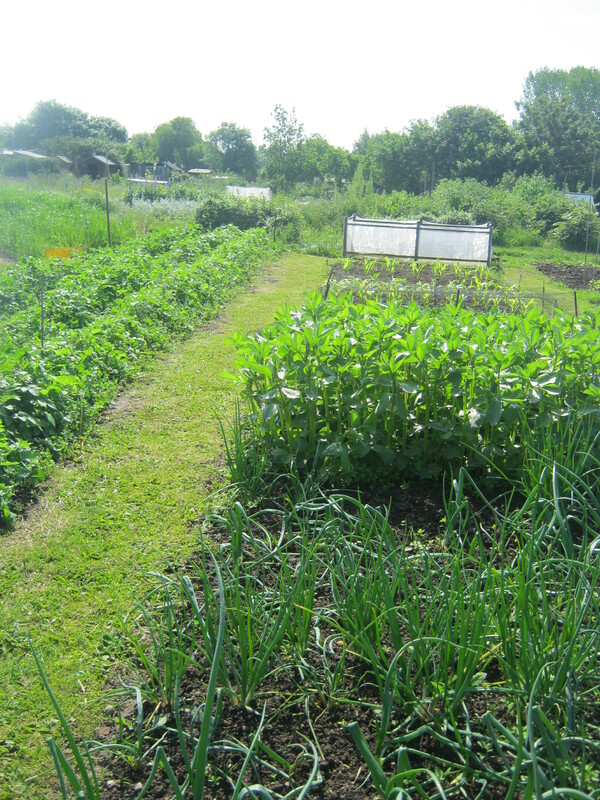 The allotment earlier in the year before the onion and sweetcorn were ready. I try to use as much of produce as I can, I hate waste, so preserving, pickling and baking are some of the things I look forward to doing. I also get a lot of pleasure from sharing the rewards. The last few weeks have seen my garden take on it’s autumnal hue. Red seems to be the theme this month. 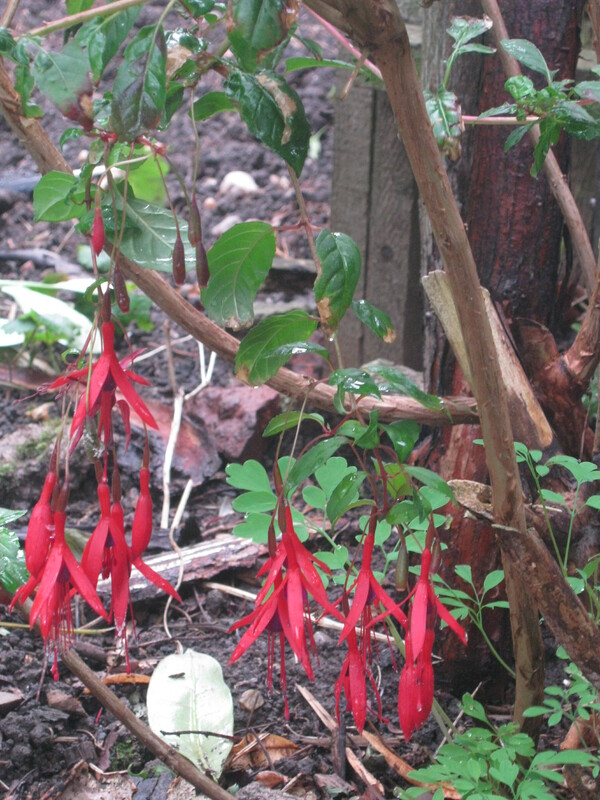 The hardy fushia have at long last started to bear lots of flowers, after struggling with yet another unknown virus or bug. 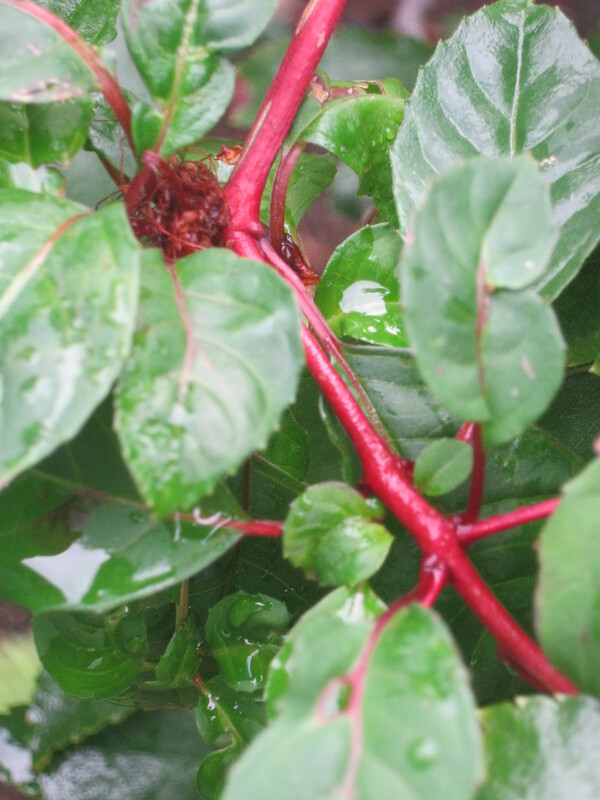 Even the stems are a brilliant red. The blackbirds have had all the blueberries even after I had covered them, canny creatures. 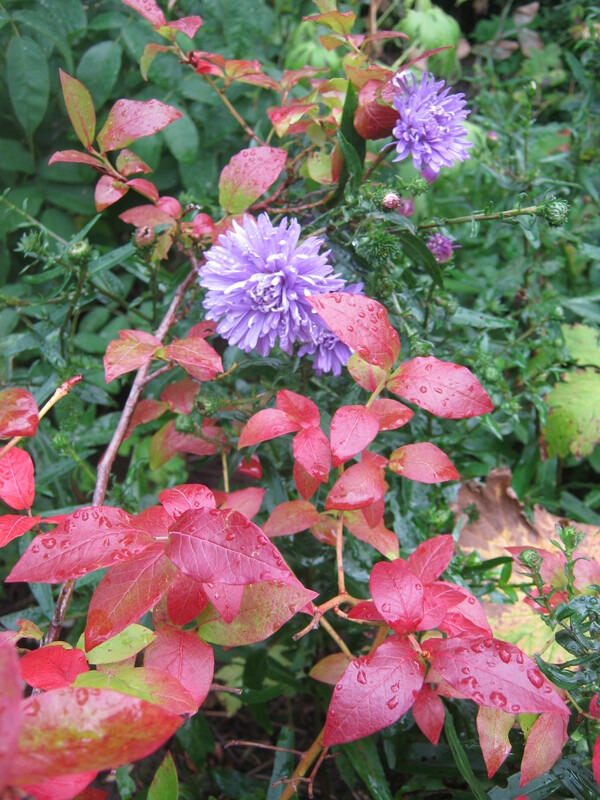 I will still grow these shrubs if only for the fantastic late summer colour, looking good with an old aster, very double with a lost label. Possibly Violet Queen but looking a little too double. 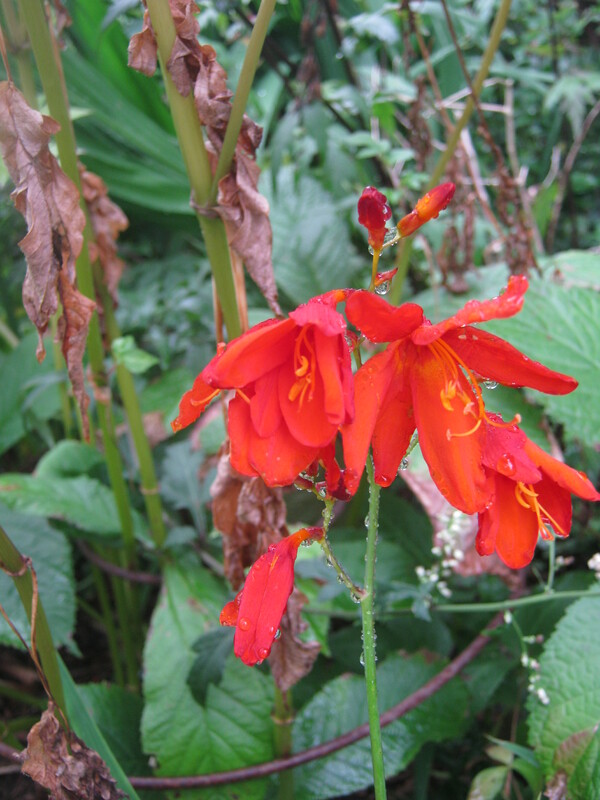 Crocosmia are not everyone’s cup of tea but this is a gorgeous deep orange red with huge flowers ,Crocosmia Mrs Geoffrey Howard. Crug Plants North Wales. 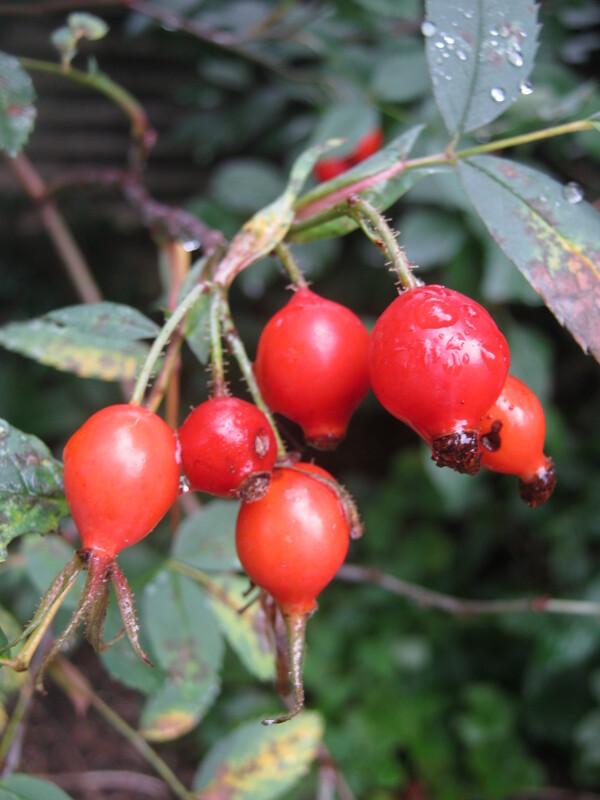 So far the hips on Rosa glauca are holding on, it won’t be long before they look quite squishy then the birds will have them. 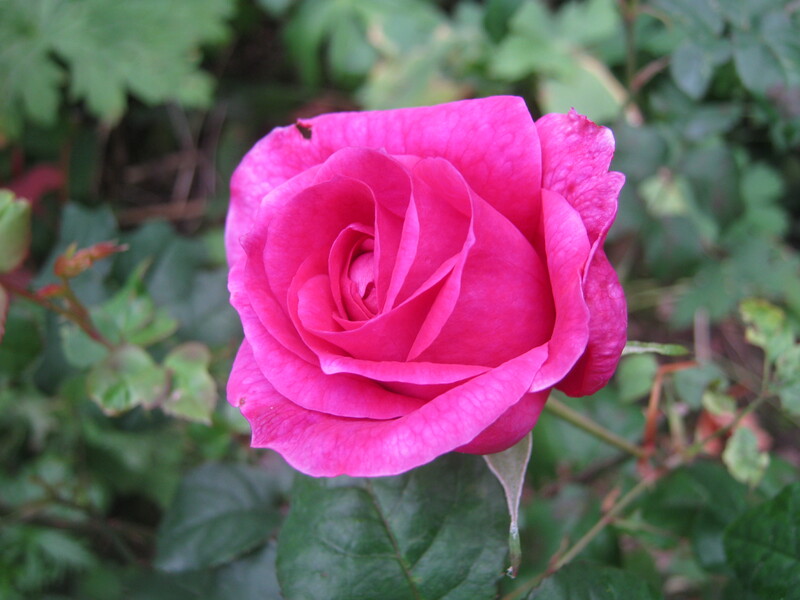 One for the boundaries of the garden as it is very thorny and a good burglar deterrent. 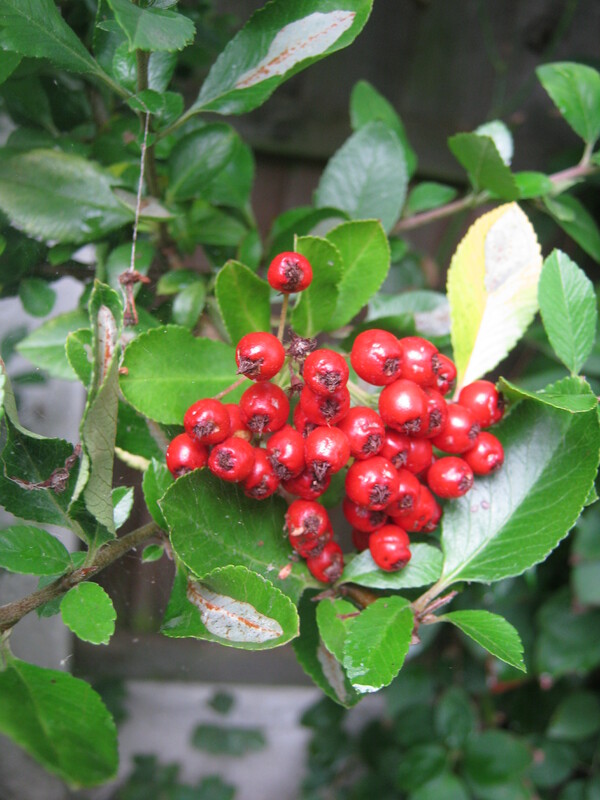 Pyracantha maybe common but the wildlife love it. 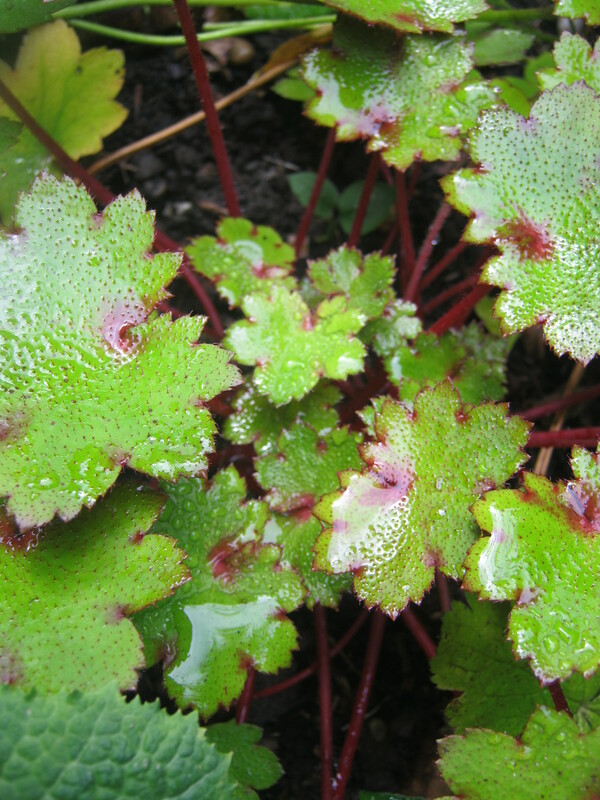 Saxifraga Blackberry and Apple Pie, lovely maroon splodged foliage another few weeks and it will have a mass of frothy cream stars. 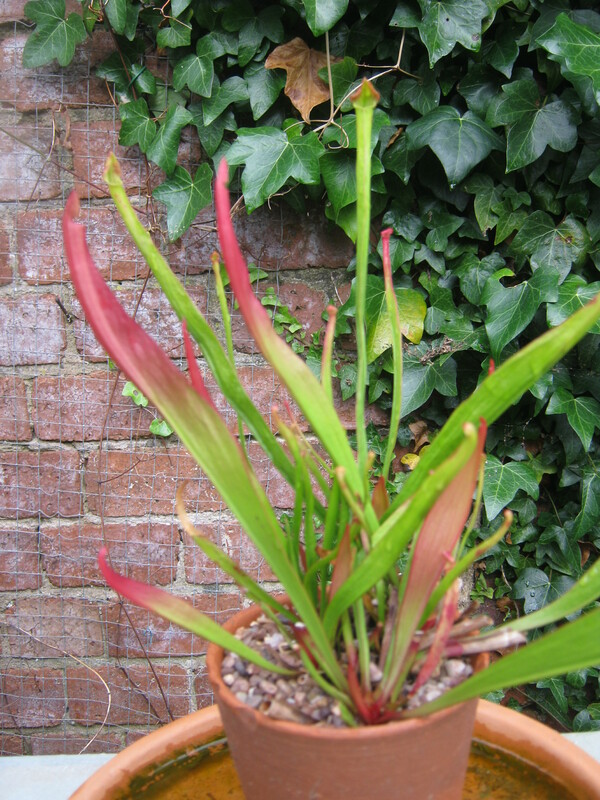 Have been growing this Sarracenia plant in the wrong place for 2 years. It wasn’t looking too good so I decided to look it up. It was in a totally wrong place, it needs full sun and to be sitting in rain water, hey presto I have a thriving plant. I think I will keep it in a pot now and bring it into the conservatory for the winter. 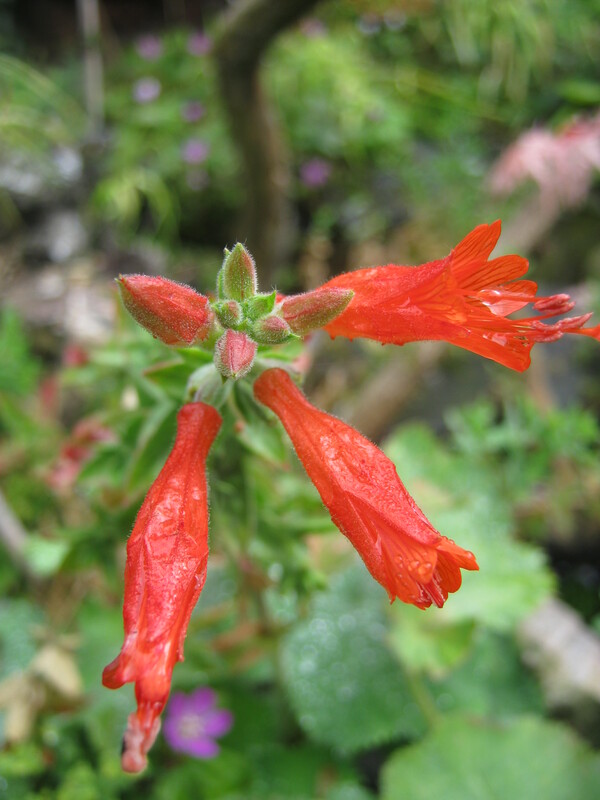 All the salvias have done well this year flowering from late spring and still many to come. 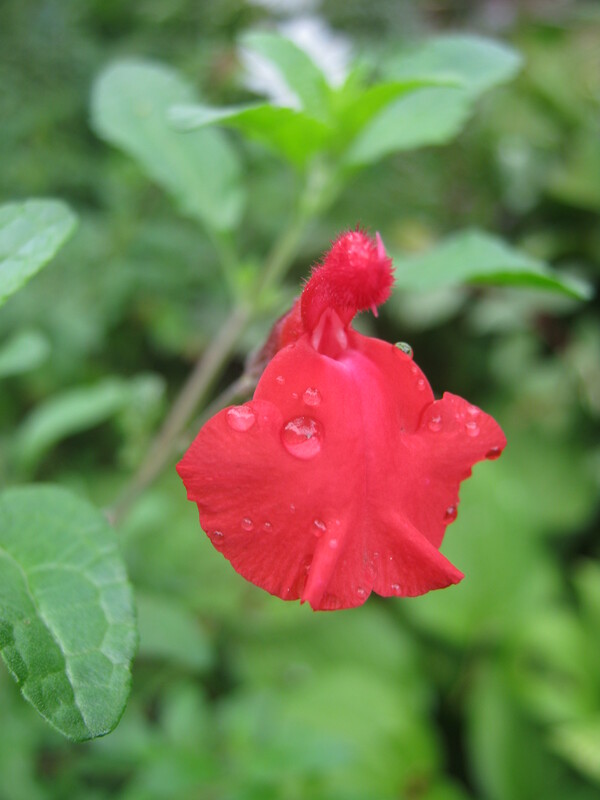 Salvia Microphylla, along with Hot Lips and Wendy’s Wish plus two more lost labels. Actea Alba. 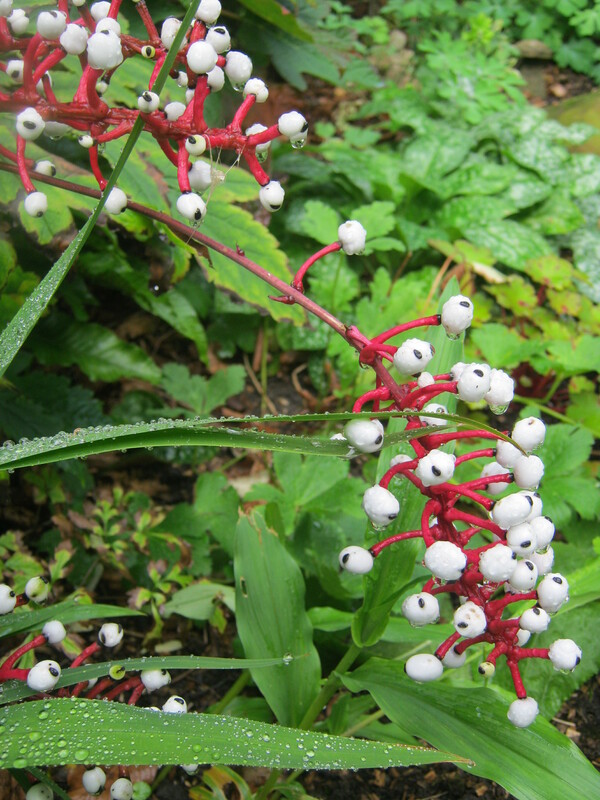 I love the contrast of the vibrant red stems with the pure white berries. 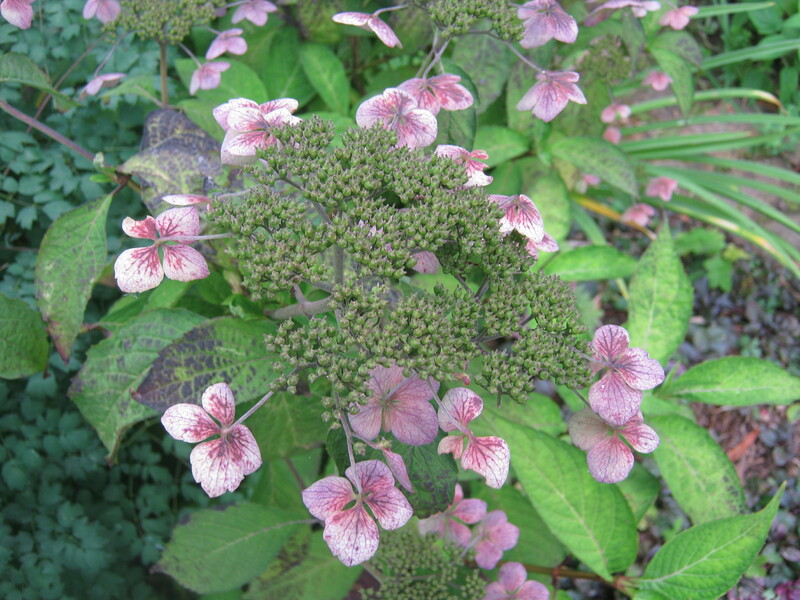 The seed germinates well and the plants light up a dark shady area. And ending with the letter Z we have Zauschneria californica ‘Glasnevin’ such a mouthful for such a small flower. Making an impact at the side of the top pond this is a welcome plant for this time of year, forming a short thicket covered in tubular bright red flowers. 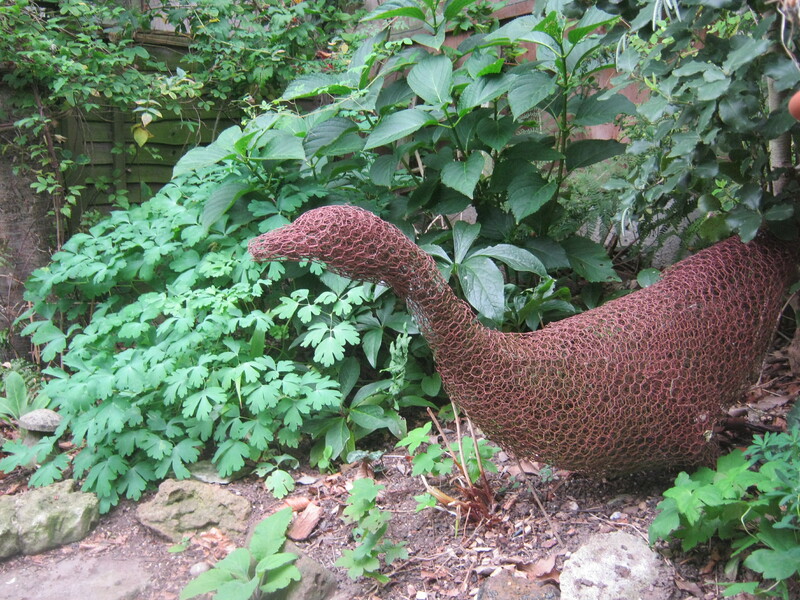 This gets cut down to the ground every year and comes back singing…..
After many years of gardening and trying to plan for all of the year it’s nice when some of the things you do come to fruition, having said that, we as gardeners are never satisfied so come next autumn things may look a little different. That’s the challenge we love……..